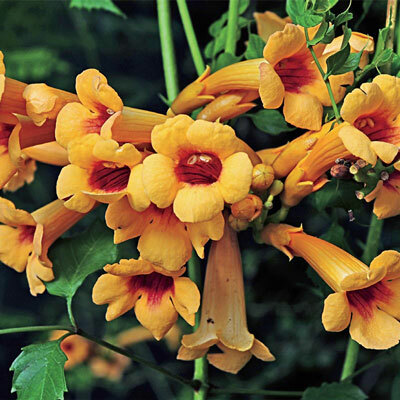 Unusual golden version of the native red trumpet vine! A mature vine bears hundreds of spectacular mango yellow blooms from summer into fall, drawing every hummingbird around! 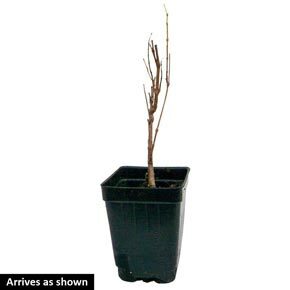 This vigorous, deciduous woody climber grows to 30' and needs a sturdy support, such as a fence, shed or pergola. Prune early spring for more flowers and to control size. Easy! Drought tolerant once established. Campsis radicans 'Judy'. Deer tend to avoid. Flower Form: Trumpet shape appearing in terminal clusters 2" across, 3" long. Foliage Type: Attractive dark green compound leaf - opposite 7-11 leaflets. Climbs by means of root-like holdfasts. Pruning: Trim to control or shape. Late winter to early spring. Soil Requirement: Average, well-drained garden soil, slightly on the dry side. Additional Information: It may freeze during severe winters but has a natural ability to regenerate.